North Tahoe junior Murphy Scott won the individual regional title at Toiyabe Golf Club on Tuesday, May 8. Scott then finished second at the state tournament in Boulder City. 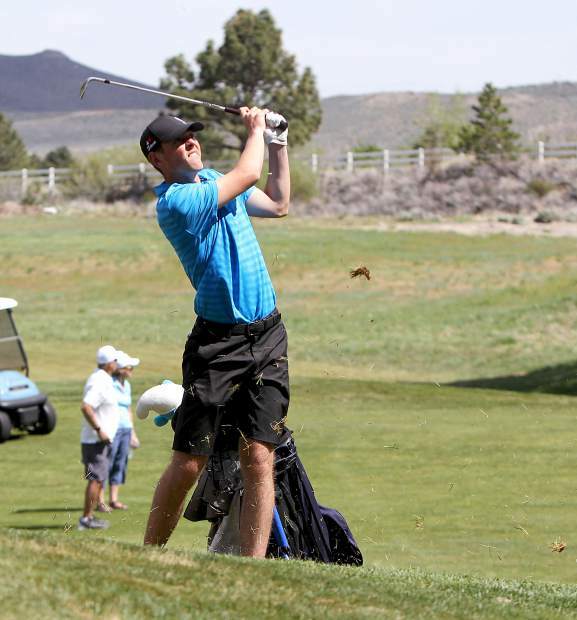 With the Class 2A Northern League golf championship on the line, North Tahoe junior Murphy Scott and Incline sophomore Satchel Hirsh stepped onto the tee box at Toiyabe Golf Club’s par-4, 18th hole tied at 76 strokes apiece. Hirsh went on to double bogey the hole, while Scott managed to card a bogey, capturing this year’s individual title in Washoe Valley with a 9-over-par 81. Scott’s championship wasn’t the only hardware the Lakers brought home from the tournament on Tuesday. As a team North Tahoe outshot six other full squads of players to claim the overall regional title. The Lakers finished their day on the par-72 course shooting a combined 100-over-par 388 to top second place Whittell by four strokes. Sierra Lutheran finished in third with 394 strokes, followed by Incline with 398. North Tahoe’s Connor Hipsley finished in third place with an 87. Jake Inclan shot a 111, and Ben Hopswood carded a 109 for the team’s four scoring golfers. Hector Vera (114) and Dominic Hatch (122) also competed for the Lakers. Course conditions were excellent with little wind, according to Toiyabe Golf Club officials, but many players struggled during the day, having had little experience playing the 6,431-yard (white tees) course. The Lakers were 22 strokes better the week before at the more familiar, Edgewood Tahoe Golf Course. With a regional title in the bag, North Tahoe’s players will now turn their focus to winning a state championship. The team will travel to Boulder City, Nevada, to play in the two-day Nevada Interscholastic Activities Association 2A State Boys Golf Championship on May 16-17. The tournament will be held at the par-72 Boulder City Golf Course.